Texting My Pancreas: Link To The Past. I never knew my mom's father. I have some idea of what kind of man he was, through the stories I've heard. There were always photos of him at my grandma's house, so I have some idea of what he looked like. (He looked an awful lot like my brother, by the way.) He passed away when my mom was young, so I never had the chance to meet him. 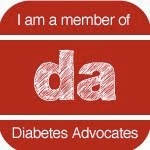 You see, he's the closest blood relative I have that also had type 1 diabetes. He was diagnosed in his mid-20's, shortly after he and my grandma were married (she made donuts one morning; he got really sick - you can guess how the rest of the story roughly goes). 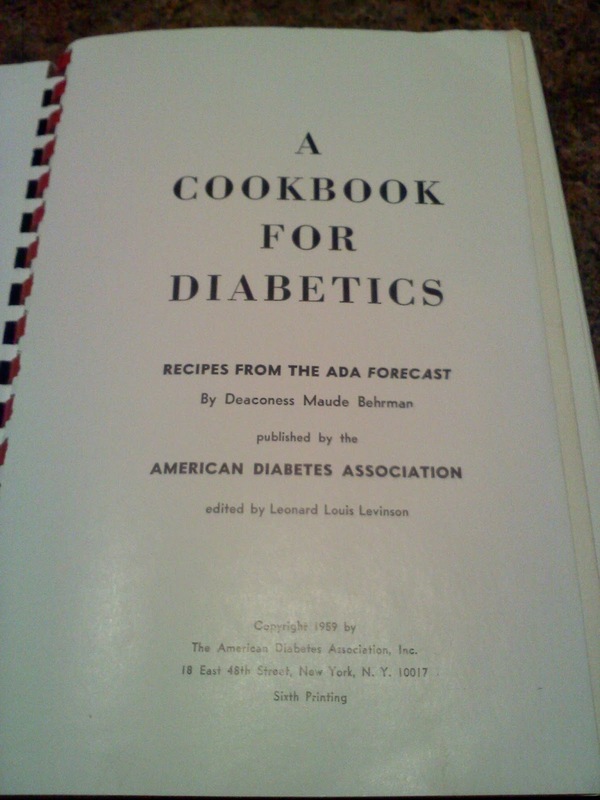 A lot of the diabetes-related technology we use now wasn't around yet - home glucose meters, carb counting, disposable needles, etc. Sometimes I think about what it would be like to talk with him. Did his lows have the same symptoms that mine do? What would he think of insulin pumps and CGMs? What did his complications feel like when they started? Would he have the same tongue-in-cheek view on life with diabetes as I do? Did living with it make him feel angry, scared, frustrated, defiant? 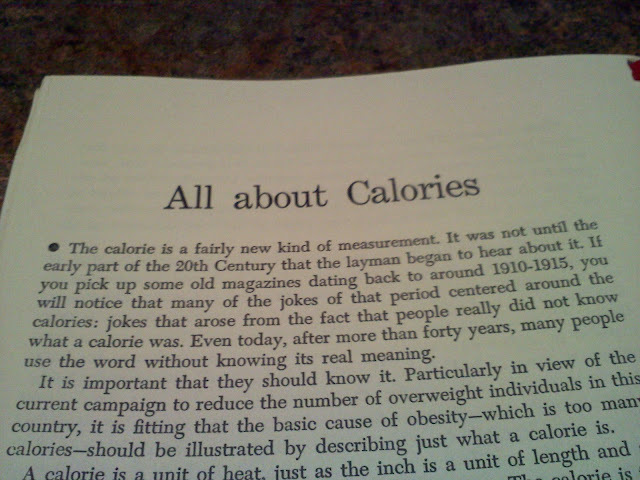 As I sorted through those boxes of childhood stuff last weekend, I came across something that was handed down to me. 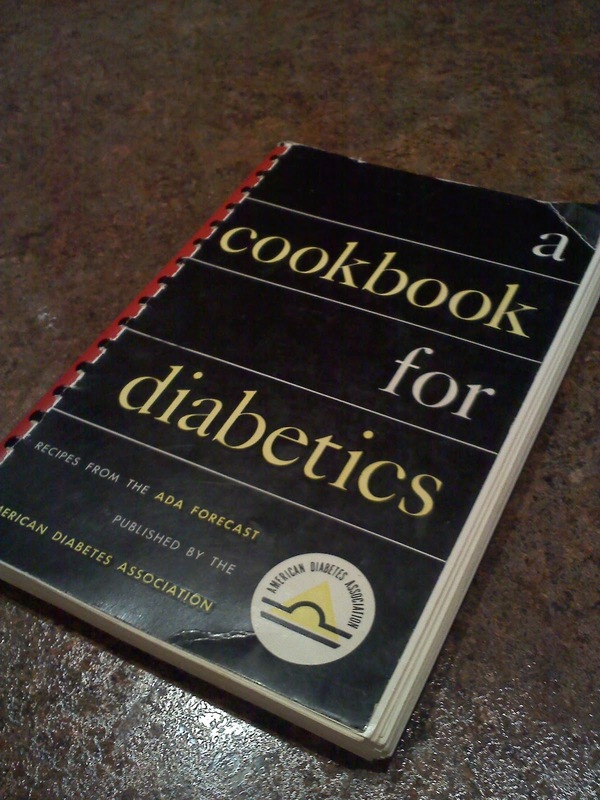 It's a "Cookbook for Diabetics", published by the ADA in 1959. I thought I'd share a few of its pages with you. Some of it is surprisingly still relevant, and some of it made me chuckle. It also made me feel all mushy and emotional, as it's something that was his. 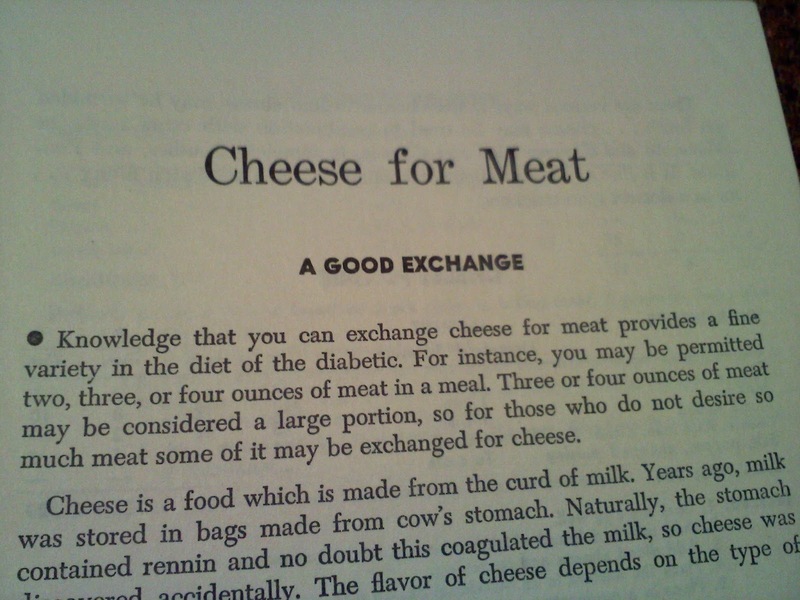 An ADA endorsement of cheese. Love it. I enjoyed reading this story. What a great "find" for you! My husband's grandfather passed away the year before my daughter was diagnosed with T1. He had type 2 diabetes (I know, totally different!!) 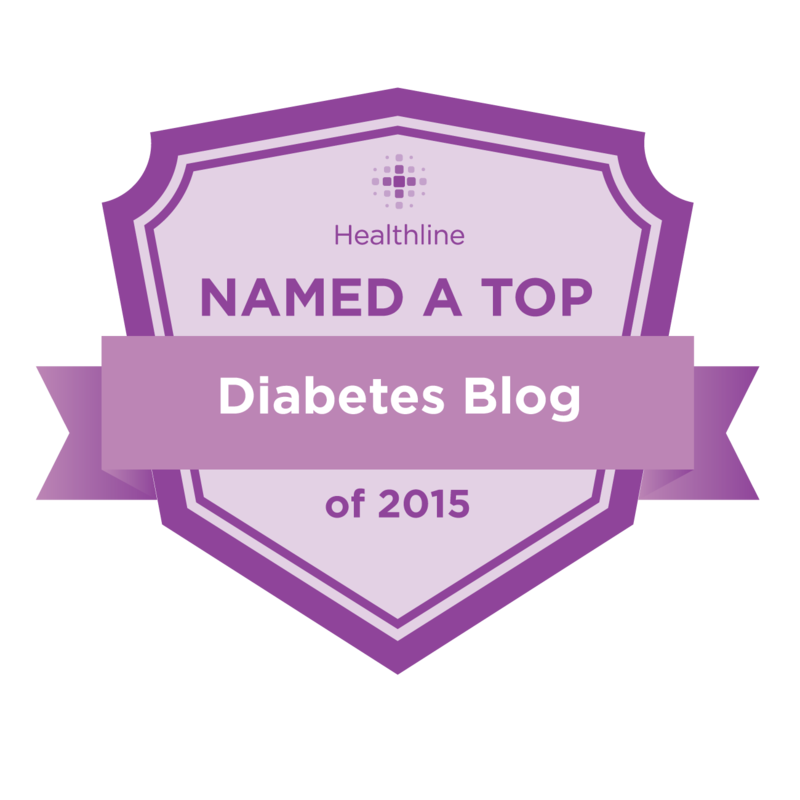 But when she was first diagnosed - at age 5 - she remembered him checking his blood sugar. She calls him her "diabetes angel". I have a great aunt (my maternal grandfather's sister) with type 1, and we're fairly sure my great grandfather (my maternal granfather's dad) had type 1. We know he had D for as long as my grandfather can remember, my my grandfather can't remember much about it, but said he was pretty sure he remembered his mother giving his father shots. I don't really feel a connection, though. Maybe I would if they were closer relatives, or maybe I would if I'd developed D as a youngster and didn't have the DOC to connect with yet. beautiful post, kim! i'd get all mushy too. hugs! If Blunt Lancent ever falls through, Cheese for Meat is a great back-up name. This is a great story - and the photographs from the book look awesome. What a truly great and special find, Kim. 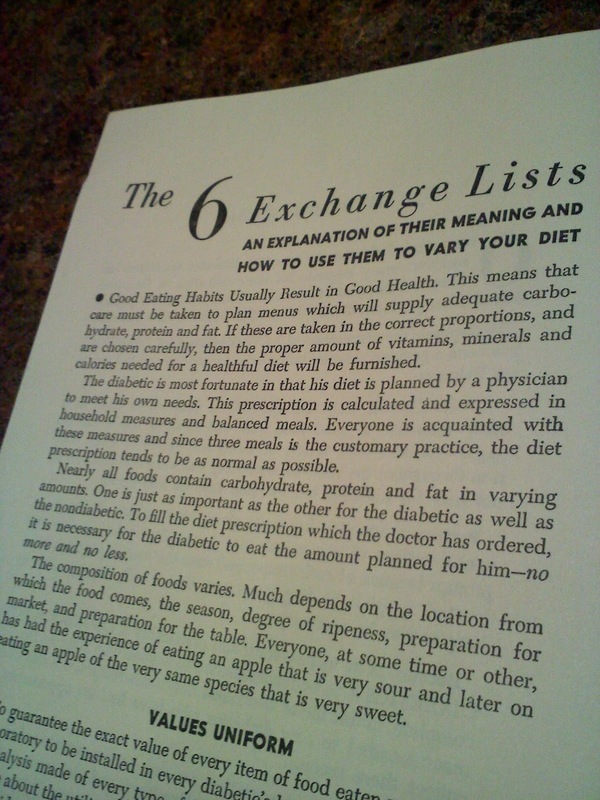 Sent my mom the link and she looked through the book pictures and thought it looked like the one she had not too longer after she was diagnosed (in 58). Funny how things have changed so much, but in some ways, they haven't. I was diagnosed in 1972, and I remember getting that very same cookbook. (At least the cover was identical!) I also had an uncle with Type I. He died just a few years after my diagnosis, and before BG meters were invented. I wish now that I could have talked to him about his Type I diabetes. Diabetes (is not) Working for the Weekend. Charlie Brown and a D-Meetup.